The ingredients in this Sumabe® formulation have been carefully chosen to support musculoskeletal health. Calcium is important to help build and maintain strong teeth and bones, while vitamin D assists calcium absorption and helps to maintain strong bones. Calcium supplementation may be beneficial during adolescence, following menopause and during pregnancy and lactation. Women’s calcium requirements are increased after menopause, and supplementation with Liquid Calcium with VitD3 may be of assistance in the prevention or treatment of osteoporosis. Adequate dietary calcium in our youth and throughout life is required to maximise bone. Calcium is essential for cellular structure, muscle contraction, nerve transmission, enzyme activation and hormone function. This means that Liquid Calcium with Vit D3 can support and maintain the health of the cardiovascular and immune systems, and contribute to a healthy pregnancy. 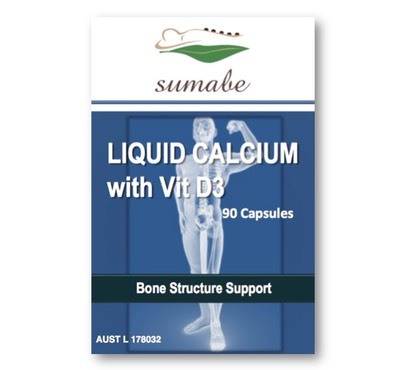 Liquid Calcium with Vit D3 helps in the improvement or maintenance of general well-being. Adults: Take 1 capsule 3 times daily, or as directed by your healthcare professional. Calcium supplementation may be of assistance in the preventionand/or treatment of osteoporosis. May assist in the prevention and/or treatment of osteoporosis. Adequate dietary calcium in our youth and throughout life is required to maximise bone. A calcium supplement formulated to strengthen bone and tissue in growing and mature users. Calcium is important to help build and maintain strong teeth and bones. Vitamin D supports calcium absorption and helps to maintain strong bones. Calcium is important for the development and maintenance of the bones and teeth. 99% of the calcium in the body is found in the bones. Calcium is essential for cellular structure, muscle contraction, nerve transmission, enzyme activation and hormone function. Calcium supplementation may be beneficial during adolescents, following menopause and during pregnancy and lactation. 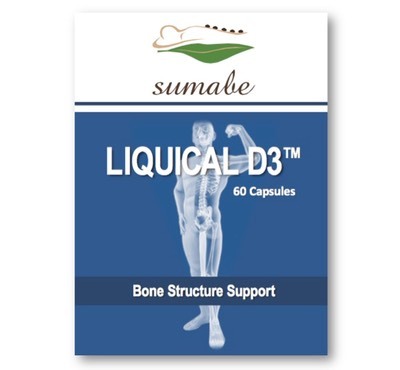 Supports the growth and maintenance of strong, healthy bones. May assist in the maintenance of normal and/or healthy blood pressure in healthy people. Supports/maintains the health of the cardiovascular system/heart. Vitamin D is important for bone health. Vitamin D supports the health and function of the immune system. Vitamin D plays a role in the regulation of calcium in the body.